I generally call this my ‘personal’ professional blog, but this post is purely personal. Our professional demeanor can be a bit of a mask of inscrutability. Sometimes it’s good to let it slip. Back in fall 1992, I was staying with a good friend in Berlin. The summer previous I had worked as a cook at Sperry Chalet in the backcountry of Glacier National Park. Although back then I worked mainly to make money to travel, this particular trip only happened because I was going through a difficult and painful breakup–ah, young love–with my Czech girlfriend. We’d had it out in Prague within days of my arrival. Alas, to make the flight worthwhile, I had booked the return flight six weeks later. Heartsick and aimless, I went to Berlin since it’s a bit of a third or fourth home. A Berlin friend noted my hangdog attitude and asked what might inspire me even if I felt like doing nothing. Mountains, I said. While I had made good coin in Montana, Austria and Switzerland would have drained me in days, so he said, go to Poland, you have that whole Eastern European thing going anyway. Poland shares the Tatra range with Slovakia; I knew the Slovak side well from previous trips. So knowing nothing in those pre-Web days other than that Zakopane was the place to go, I hopped a train and made my way there. Poland’s side of the range has backcountry huts akin to those I knew in Slovakia, so I dropped my heavy climbing gear and books in a bag at the train station and set out with no goal other than to get to the first one before dark. This was October, so it was already cold and fairly dark, but contrary to summer, when Poland overruns the Tatra with humanity, there was nobody on the trails. I can still recall keenly how within a couple of hundred metres of forest I felt this wave of joy come over me. The smell, the silence, the rhythmic cadence of walking and breathing were like a drug. I remember bouncing along with my pack and smiling like a fool. People often ask me where I’m from because I’ve lived pretty much everywhere; I’m an American who lives in Canada and feels more at home in Berlin or Leipzig than in the city where I currently live, which I adore. In reply, I typically say Colorado, although I was born in Ohio and left Colorado over 20 years ago. Still, within a short time of moving there at ten, my father introduced me to the joys and suffering of alpine backpacking. What I realize now that I am older is that I say Colorado mainly not because I lived there in my ‘formative’ years, although I did, but because it is at altitude, in the thin, dry mountain air that I unfold my brain and let go of my preoccupations and best live in the moment. Ask anyone who has ever climbed or skied with me; the precise, controlling, serious me gives way to an exuberant inner child/explorer that few see otherwise. I’ve had this experience over and over again, and it has never failed, no matter where the mountains may be. I am from the mountains. Arriving at the first hut, Hala Kondratowa, I was relieved to find it open as the alpine society office in Zakopane had promised me, or so I had understood. It was also empty save for the staff and two German hikers. They heard me order dinner and ask about a room and immediately came over and asked me if I spoke English or German (my kit was clearly Western). Why, yes, both. They thought I was a Slavic language miracle worker although all I had done was use my pan-Slavic pidgin Czech-Slovak mashup as I always do around Slavic folk. We fell into conversation and agreed to join up and spend the next few days hiking hut to hut. The weather went from bad to laughably bad–I recall traverses that had chains mounted to hold on to for summer hikers, only now there was snow on the ground and ice on the chains, what fun!–but after a summer in Montana that had seen blizzards in August, I was feeling pretty damn hardened. We had a great time, having the mountains more or less for ourselves, other than seeing Polish soldiers walking the Slovak border. Why bother, one wonders, but if you have to do military service, you could draw a nastier gig. I distinctly recall sitting on some high point on the border ridge, sitting on the cement border marker, while my German companions laboured to make tea on their alcohol burner. Great cup of tea that was, in the cold drizzle and mist. One afternoon we even saw a group of the elusive and beautiful chamois goats that roam this range. After the last hut, we shuttled back to the city, had a big Polish meal to celebrate, then parted ways. I cannot remember their names (Holger? From Hamburg? ), but I do recall that one worked at a university and was the first person who ever gave me an email address as a contact. Before we parted, I did ask them where I should go next. Maybe-Holger asked me what I wanted. Frankly, I was cold and wet still, so I said a beach and sun. He suggested Portugal, which is about as far from Poland as one could go, but I decided I couldn’t resist the alliterative allure of going from Poland to Paris to Portugal, so off I went and got a bit lost there before returning to Prague to shut the door on the relationship for good. But Portugal is a story for another day, although being hustled by an Australian surfer into paying for dinner is a fond memory (beware, Paul Rubio, it’s a small world and you owe me). Oddly, I have no pictures from that trip. I’m not sure if my camera was broken or I was in some kind of “no images” phase, or likely just too broke for film, but the only pictures I have are in my head. So 24 years on, I went back to Zakopane. I’m attending the Digital Humanities Conference in Kraków next week, and decided to come a couple of days early to relax and get over jet lag so I’m coherent and sharp at the conference. If I’m really honest, however, it was the proximity to Zakopane and mountains that drew me to show up early. Getting there was a bit of re-immersion in Polish queuing culture. Although Zakopane is only about 100 km from Kraków, trains run rarely and take three to four hours. There are myriad private buses, and I figured a Saturday afternoon would be no big deal. Ha. I waited for five buses before I finally was able to board and experienced what my friend Warren would call severe encroachment on my personal space each time I tried. Even tried renting a car–because, you know, driving after an overnight flight on roads you don’t know with half of Poland out and about, what could go wrong?–but gave up when I discovered that the agencies all shut down on Saturdays. I finally boarded a bus, and then experienced how little investment Poland has made in its road infrastructure. At one point, the road to the largest tourist destination in the country crosses a one-lane bridge over a modest river. While much has changed in Poland–the complete absence of polluting “old era” cars is a relief–it would appear that they still have some ground to cover with public infrastructure. Finally arriving in Zakopane, I grabbed a cab to my vacation apartment and then headed out to dinner. Literally the first restaurant I stumbled upon turned out to be the place where the Germans and I had had our post-hut-tour blowout meal. Still there, still excellent. Eating in Poland is a treat for the lactose and gluten tolerant omnivore. Stumbling upon this establishment seemed like an omen or an inevitability. 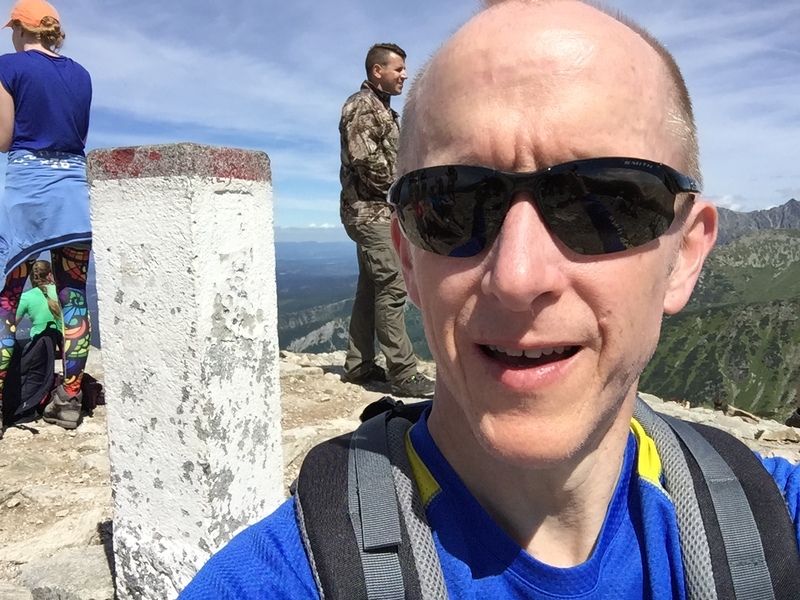 But I didn’t come to Zakopane to eat smoked cheese and pierogi, but to hike, so hike I did, about 25-30 km in the one full day I had at my disposal. After an eternal hike through town to the trailhead, I started up a valley into the mountains, and as happened a generation ago, within a few minutes my spirit was lifted and my mind went quiet. Breathe, step, breathe, step. Marvel at the view, enjoy the sun. At the top of this particular valley, one arrives at a pass on the saddle between two peaks, one of which is Giewont, famous in Polish legend and perhaps one of the most climbed peaks in the world based on my experience there. I could see the horde of humanity snaking up the trail, but my brain told me that it was right there and only a fool would pass up standing on Giewont once in his life. If I thought queuing to catch the bus was bad, the queue to get off the summit of that peak might stand permanently as the worst queuing experience of my life. I seriously wondered how it doesn’t happen daily that some poor person gets shoved off the summit in the crush for the descent. Mayhem, but in hindsight it really was kind of funny and worth experiencing, once. Completing the cycle, and perhaps doing a reverse exorcism on memories from 1992, after climbing up to touch one of the border stones I made the long descent back down the Kondratowa valley and stopped for tea at the Hala Kondratowa. Still there, virtually unchanged. Most of what I’m writing here came to me while hiking, and I started writing while sipping that tea. That those 24 years marked the span from my first email contact to having a device that not only allowed me to write with my thumbs, but to text with my wife 6,000 miles away, makes the head spin a bit. In some way, this hike and this entire pilgrimage to Zakopane felt like the conclusion of a long arc spanning the last 24 years. I don’t know why, other than that trip in 1992 marked the beginning of the end of a low period in my life–my mother’s death, severe health problems that I had been told would be with me all my life, the loss of my first love–and perhaps for that reason stands like a milestone in my head. All I feel now–despite the traffic, crowds, and elbows–is joy and gratitude. Joy that although I am much older, my health not only returned in 1992 but has held and that my body is physically able to carry my all my senses to such ethereal places, just to behold and experience them. Gratitude that I have the means and ability to enjoy these things. Ironically, when I traveled and worked in Eastern and Central Europe in the early and mid 90s, as an American everyone assumed I was some wealthy scion, not an itinerant waiter, dishwasher, cook, and ski salesperson whose possessions were all either on his back or in the ancient VW Rabbit I left parked in friends’ driveways when off on some adventure, with nothing in his bank account but enough to get home, hopefully. Gratitude (and joy) that I have a loving family that shares and supports my sense of adventure. Not least, gratitude that there are places one can go, such as Poland, and rely on the kindness and generosity of strangers, who simply respond to human need and curiosity with a helping hand or a friendly gesture. May this never change, and may we all respond in kind.